I’m lucky in many ways. I have a child who is a good eater. So good, she’ll eat many things that are not even food — and a few that actually are. While this sure makes a plate of broccoli less challenging for both of us, these early years are aging me fast. To make it worse, I encouraged her to try the herbs and vegetables in our garden. Now, she thinks all plants are food. I’ve called the non-emergency poison control line three times so far. I hope they never get to know me by name. All three times were over gardening. And I am not alone. Each year 100,000 calls are made to Poison Control (1-800-222-1222) over exposure to toxic plants and mushrooms. 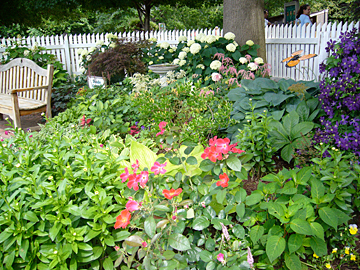 Some of the most common plants used in gardens and landscaping are extremely poisonous. Here is a list of a few that may be in your yard now. Hydrangeas are among the most poisonous, yet this lovely flowering bush is a favorite of gardeners. All part of the plant, especially the budding flowers are poisonous. Ingestion can lead to cyanide poisoning symptoms including coma and death. Other common garden plants that top the most poisonous list include; Azalea, Foxglove, Periwinkle , Glory lily, Poison hemlock, Castor bean, Rhododendron, Jequirity bean, Jerusalem cherry, Rosary bean, Jimson weed, Larkspur Daphne Laurel cherry St. Johnswort Death camas, Lily-of-the-valley, English laurel, Morning glory seeds, Elderberry, Deadly Nightshade, Water hemlock, Oleander, Wintersweet, Yew berry. Even your vegetable garden likely contains two plants that top the most poisonous list; tomatoes and potatoes are both members of the nightshade family. Leaves and stems of these plants are poisonous. Rhubarb leaves are also toxic. Check the list on the Poison Control site to learn more about common toxic plants. It may be a good idea to do this first before you plan any landscaping if you have small children and pets. The site also offers advice on what to do if you suspect your child has eaten a poisonous plant. Never allow a child to chew on jewelry made from seeds, beans, or grasses from plants. Learn to recognize plants that may cause a rash, such as poison ivy, poison oak, or bull nettle. As for me, I am going to go pull up the hydrangea and lily of the valley I just planted. I want to save more than just a phone call. These are great tips and I will be sure to use them with my kids. I am trying to get them interested in planting and growing and will need to make sure they know dangers which are not so obvious. When I was a kid my mom went out back and picked a bunch of mushrooms and sauteed them in butter and we ate them. We ended up in the ER late that night. So I happen to know for a fact that poisonous mushrooms taste every bit as delicious as non-poisonous ones. Been lucky so far with my kids. My husband taught them which plants they could eat from the garden, and they stick to that list. Leaves are by permission only, because otherwise my mint and basil wouldn’t stand a chance. Mine will go pick the herbs and eat at will, and lettuces. I am working on identifying the ones off limits, even pulling up a few! Thanks for these garden tips! I’m starting to have grandchildren, and I really want to protect them from poisonous plants. I’m following this guide, no grandmother wants something happening to her grandchildren.